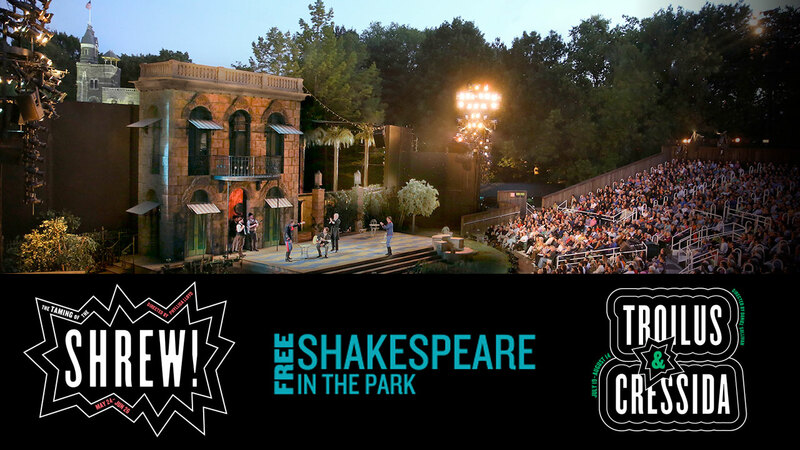 NEW YORK -- Enjoy Shakespeare's finest plays in Central Park, for FREE! The 2016 season of Shakespeare in the Park at the Delacorte Theater is currently featuring "The Taming of the Shrew" (May 24-June 26). Other upcoming shows include "Troilus and Cressida" (July 19-August 14) and "Public Works: Twelfth Night" (September 2-6). This summer, Tony nominated director Phyllida Lloyd turns Shakespeare's zany comedy of the sexes The Taming the Shrew on its head, with an all-female cast and a bold new take. Lovely Bianca is the prize to be won by all the men looking to land themselves a wealthy wife. But the competitors will first have to marry off Bianca's clever, fiery older sister, Katherina, played by Olivier Nominee Cush Jumbo (Josephine and I, The River), who may just outsmart them all. Tony and Olivier winner Janet McTeer (A Doll's House, Mary Stuart) plays Petruchio, the wild outsider Katherina must outwit, in Shakespeare's original screwball comedy showing the lengths men will go to for their legacy, what women will do to break free and the outrageous things we all do for the human heart. Tony winning director Daniel Sullivan (Proof, Cymbeline) returns to Shakespeare in the Park with one of the Bard's most rarely produced plays, Troilus and Cressida. Both warriors and lovers play hard to get in this surprisingly modern epic about the hot blood, hot thoughts and hot deeds of the ancient Greeks. In the 7th year of the Trojan War, Troilus, a young prince, pines for the affections of Cressida, a bright young woman who knows how to play it cool. Meanwhile, the heroes of the Iliad - Ajax, Ulysses, Achilles and the kings they serve - debate whether to return the dangerously beautiful captive Helen or continue to fight without end. Nations and lovers alike do battle in this funny, piercing drama about romance and revenge in a world at war. For more information, visit http://www.publictheater.org/en/programs--events/shakespeare-in-the-park/.